When I was a child and learning to knit, I remember my mum chanting these words to me, until eventually, my brain started chanting them on its own. As with learning to do anything, repetition and concentration are the keys to success. Once you know what you are doing it is simple and you do it without even thinking. This video will explain in detail how to cast on, knit and then cast off again. I must admit however that I have never seen this method of casting on. I usually do it with two knitting needles, but maybe this way is actually a bit easier. Why In, Over, Through, Out? ‘Through’ is when you take the needle through from the back to the front or the front to the back. 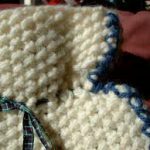 Once you have mastered basic knitting, it is time to change it up a bit and master purl stitch. Don’t get too frightened by the name, purl stitch is simply garter stitch but the needle goes in through the front of the stitch instead of the back. You can find out how to knit purl by clicking here. It is normal to feel frustrated and like you will never get the hang of it at first, but believe me, if you persevere you will be so proud of yourself. 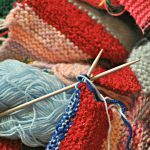 Like any skill, knitting does take some time to master and feel comfortable with, but once you do, you will never look back. 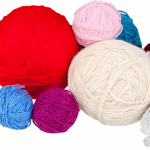 Hope these basic knitting instructions help you to become the best knitter that you can be.